Major League Baseball Poised To Change Intentional Walk Rule : The Two-Way The proposed rule change would mean forgoing actually throwing four pitches. Instead, the bench would simply signal to the umpire that the manager wants to give the batter a free pass. 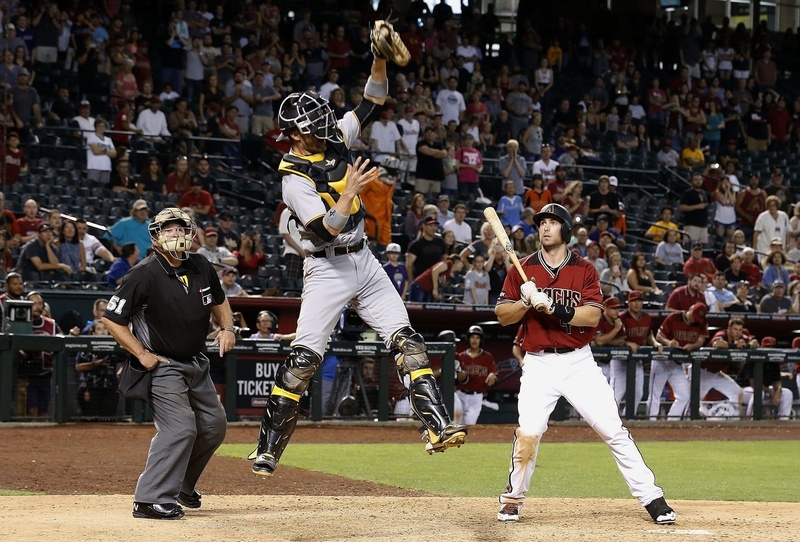 Pittsburgh Pirates catcher Chris Stewart grabs an intentional walk throw in a game between Arizona and Pittsburgh last year in Phoenix. In baseball, if a pitcher wants to intentionally walk a batter, he has to actually lob the four pitches outside the strike zone. It's a technique often used to bypass a particularly strong batter, or to set up a double play. But that rule now appears poised to change. The Major League Baseball commissioner's office has proposed a rule change to have the pitcher forgo actually throwing four balls — instead, the bench would simply signal to the umpire that the batter will be intentionally walked. The head of the players union, Tony Clark, has signaled that it is amenable to the change, according to The Associated Press. "As part of a broader discussion with other moving pieces, the answer is yes," Clark told the wire service. "There are details, as part of that discussion, that are still being worked through, however." Mike Teevan, vice president of communications for Major League Baseball, tells The Two-Way that the change is currently under consideration. Any rule change involves many parties, he explains, and "that process is not yet complete." MLB.com has reported that we could see the change as early as this upcoming season. This is part of a larger push to ramp up the pace of the game, and it comes after Commissioner Rob Manfred told reporters on Tuesday afternoon that there would be no "meaningful" rule changes for the upcoming season after they were not accepted by the players union. "We didn't make a deal; we couldn't make a deal," he said, sounding frustrated. Among the proposed changes: introducing a pitch clock to reduce the time between pitches, and capping the number of times a catcher can conference with a pitcher. Manfred argued that these changes would have "little effect of the competitive character of the game" but would "take dead time out of the game" and "keep fans engaged." These remain on the table, he said. "I think it's a mistake to stick our head in the sand and ignore the fact that our game has changed and continues to change. Since 1980, home runs are up 32 percent. And strikeouts are up 67 percent. Last year, balls in play were at a record low, and we all know that things like the use of relief pitchers has changed dramatically in the last 30 years. I'm firmly convinced that our fans — both our avid fans and casual fans — want us to respond to and manage the change that's going on in the game." "You're changing or altering the essence of the sport under the guise of speeding it up minimally," ESPN host Michael Smith argued. "The object of the game is to pitch to a batter — you should still have to execute those pitches." "My thing is, if they really want to speed up the game, then when a guy hits a home run, to speed up the game should a guy, just like in softball, when he hits it, should he just walk to the dugout? It'd be quicker. I'm just wondering, at what point do we just keep the game, the game?" It's also worth noting that intentional walks don't happen all that often. According to statistics provided by MLB, there were 932 intentional walks during the 2016 regular season. That's about 1 every 3 games.